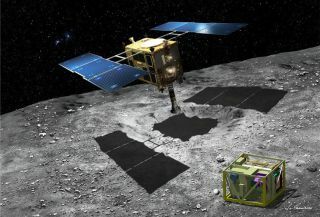 Artist's concept of Japan's Hayabusa 2 spacecraft near its target asteroid, currently called to 1999 JU3. Japanese space officials want you to help them come up with a better name for asteroid 1999 JU3, which the nation's Hayabusa 2 spacecraft will study up close a few years from now. In collaboration with the International Astronomical Union (the keeper of official astronomical names), the Japan Aerospace and Exploration Agency (JAXA) has initiated a naming contest for asteroid 1999 JU3. The contest closes on Aug. 31. Proposed names for the asteroid must be no more than 16 characters long (including spaces and punctuation); one word, if possible; easily pronounceable; written using Latin characters; and unoffensive. Additionally, the name can't be too similar to the moniker of another space rock. The name will then be considered by the IAU's committee for small-body nomenclature before final selection, which is expected to be announced in late November. Names of celestial objects and their features are usually proposed by scientists involved in the objects' exploration or discovery, but researchers have increasingly asked the public to participate in this process. For example, the team behind NASA's New Horizons mission to Pluto recently asked people around the world to submit names that will go on the first detailed maps of the dwarf planet and its five known moons. (New Horizons performed the first-ever flyby of Pluto on July 14.) Researchers also solicited name suggestions from the public for a few craters on the planet Mercury, in honor of the closing days of NASA's MESSENGER (Mercury Surface, Space Evironment, Geochemistry and Ranging) mission. Hayabusa 2 launched in December 2014 and is scheduled to arrive at asteroid 1999 JU3 in the middle of 2018. Hayabusa 2 will stick with the space rock for about 18 months, sending a small lander to the surface and picking up a sample to return to Earth in 2020.